Pete is our wonderful, sweet, upper-level canter horse who has been with the team since the fall of 2007. He carries individual compulsories, freestyles, and Pas de Deux. Although primarily used for the canter vaulters, Pete's wonderfully smooth trot and fabulous personality enables the team to use him for any combination of walk, trot, and canter vaulting at demonstrations and other events. Pete loves his job and especially looks forward to the pats and treats he receives during each practice. When not vaulting, Pete is cross-trained in dressage and ridden out on the trails at Rickman Horse Farm. 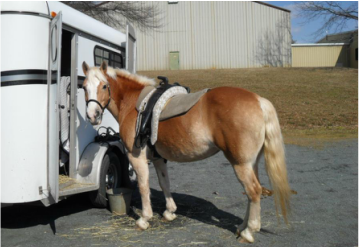 Murphy is a wonderful, calm, and experienced vaulting horse who has been vaulting longer than any of our vaulters! Once an upper-level team and individual canter horse, Murphy is now enjoying a well-deserved retirement. Murphy enjoys grazing in the filed with his buddy, Pete, and teaching our youngest vaulters a variety of horsemanship skills.